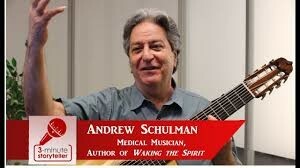 The Jewish Federation Connecting with Community presents "The Art and Science of Medical Music" with professional musician, Andrew Schulman, author of "Waking the Spirit: A Musician's Journey Healing Body, Mind and Soul." In 2009, Andrew underwent surgery, complications ensued, and he had a near death experience. Miraculously, his life was saved because his wife played his favorite music for him while he was in a coma. The experience led to his pioneering work with Dr. Marvin McMillen, now a senior physician at Berkshire Medical Center, in developing the specialty called Medical Musician. That is his story told both in his book and for this program.